I think butternut squash chips have won over the hearts of everyone in our family. We love kale chips but these golden chips have taken first place at home for this week at least. I've looked at the veggie chips at Trader Joe's and Metropolitan Market; we have tried them all, but being the "do-it-yourselfer" that I am, I could not resist making my own. I began with a butternut squash. Chose the ones with really long neck and a small bulb, that way you can get a lot of flesh before you get to the seedy part. I then use my ceramic mandolin, they are inexpensive and very sharp, to slice them very thin. Try to get a mandolin with an adjustable dial, then you can adjust the slices to your preference. Once you have your squash thinly and evenly sliced, then sprinkle with olive oil and salt. Spread them evenly onto the baking sheet or sheet pan. 2 squash will make 2 pans of sliced squash. Now you have to bake then, which is the tricky part. The oven should be a low one. 300 F has been working for us. They need a bit of careful watching while in the oven. Slices on the edges of the pan will brown more quickly and burn if not removed when golden. Smaller pieces will also cook more quickly so they will have to be removed as they cook or they will burn. After about 15-20 minutes of careful watching you should have golden chips that really taste like a concentrated butternut squash soup! Sometimes the little burnt pieces are the best part of all. Autumn does not feel like it is here but the calendar says otherwise. It's October and the temperature today was almost 70 degrees. I read somewhere that we have had 77 days in a row without any measurable rainfall. Part of me is afraid to even repeat that fact less I jinx the whole greater Puget Sound area. A visit to the garden this morning at 8:30 a.m. proves Fall is here in force. When I pulled up my summer squash, zinnias and snapdragons this morning they were pretty much frozen. I began cleaning up my garden plots and filling low spots with 3 way topsoil. This is a great time to amend soil as well with compost but time does not permit me to take advantage of the compost buy in this time but I will definitely build up my soil other ways and add compost in the spring. With my plots mostly cleared of weeds, I began covering the bare ground with leaves and straw. I try to alternate between leaves (free from the park) and straw (costs money but is convenient to use) or use a mix of both. Putting a thick mulch on your plots really helps with weed suppression over the winter and spring. I advise it wholeheartedly. See photos of adjacent plots, one used leaves to put their plot to bed and one did not. Here is a plot that was covered with leaves in the winter and when planting time came around, all they had to do was remove the leaves, amend the soil and plant! This plot did not use any sort of overwinter mulch on their plot. By late Spring, the weeds that had grown over the winter and early spring were a force to be reckoned with. Moral of the story: Save yourself a lot of work in the spring and put your plot to bed with a mulch over the winter! 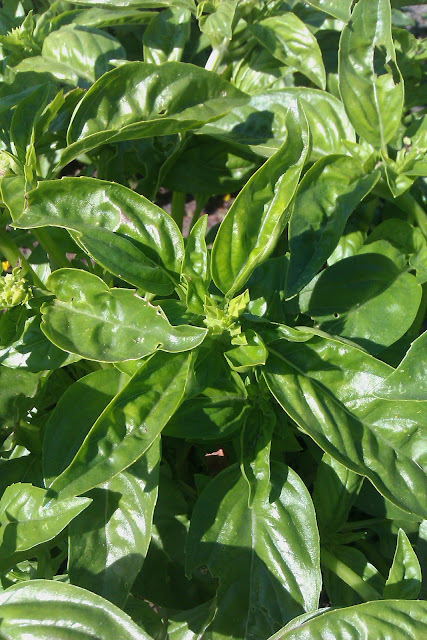 It is time for pinching your summertime basil, says Tom. Here is more of his sage, I mean basil-ey advice. "With August summer and sun, my basil has really taken off. Other than a modest amount of watering, weeding and occasional fish fertilizer, my thoughts turn to pinching at this time of year when it comes to maintaining my basil plants." "First, this means pinching the top leaves from the main stem when my basil plant becomes 6-8 inches tall. This will cause the basil plant to branch out and become bushier." "Secondly, this means you should pinch any and as many florets that develop on your basil plant. Untouched, this will only encourage your basil to bolt instead of energy towards leaf production. It can take a good deal of time to find and pinch florets as basil tends to grow lots and lots of florets." "Just be sure not to throw away the florets when you are done! Chopped up roughly, basil florets make a great ingredient for salad dressings, marinades and pasta dishes since florets have a high concentration of basil oils. Yum!" Thank you Tom for your great advice, we are so glad the weather has warmed up enough to keep the pesky slugs at bay and to give our basil plants a chance to really take off! See Tom's photo below, this is precisely the time in which to start pinching. There is no doubt that home gardeners take pride and joy in growing a fabulous tomato, there is nothing else like it. I think everyone at the garden, all 167 gardeners are growing tomatoes. There is pride that comes in spending the time to put in the starts, pruning the plants, weeding, watering then waiting until the fruit ripens. So much depends on that glorious, sweet, better than the supermarket tomato, that tomato is a confirmation that we can grow with our own hands what money cannot buy. This is a sad photo of all my potato plants as well as half of my tomato plants. I wanted to pull the plants before all the fruit and spuds got affected. I did not get many spuds but I got some. No tomatoes to speak of though. The telltale sign of blight, purple and/or black stems on tomato plants. Same thing with potatoes, they get purple or black stems, their leaves and stems get brown spots on them and then they turn yellow and wilt. Same purple and black stems on potato plants.